Curved blade and end-bend blade are considered as effective passive control methods for improving the aerodynamic performance of a compressor cascade, and their applicability also needs to be further studied. A highly-loaded compressor linear cascade in the design condition was taken as the research objective in this paper. Numerical simulation was used to study the positive and negative effects of these methods on the flow loss of the cascade by redistributing the vortex structures. Results show that: the curved blade could reduce the flow loss to 2.55%, while the end-bend blade and the end-bend+curved blade increase it to 10.58% and 2.19%, respectively. The positive effect of the curved blade weakens the strength and scale of Concentrated Shedding Vortex (CSV), which accounts for 59.2% of the total flow loss. The negative effect of the end-bend blade exacerbates the low-energy fluid clusters from the end wall and wake into CSV. Finally, the end-bend+curved blade can take their own strengths, but it enhances the twisting motion of Passage Vortex (PV) and CSV, which makes it fail to reduce the flow loss. Therefore, the positive and negative effects of these methods on the flow loss of a compressor cascade are much clearer. In addition, we also predict the potential danger of the end-bend blade in the negative incidence conditions and provides some suggestion for future study. This study was co-supported by the China Postdoctoral Science Foundation (Grant No. 2017M621268), and the National Natural Science Foundation of China (Grant Nos. 51436002 and 51506020). 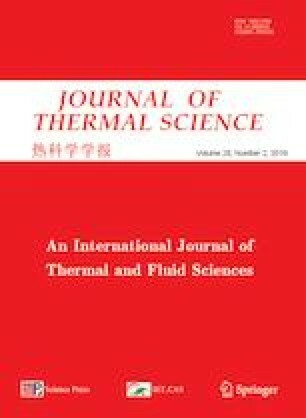 The authors would like to thank Prof. Songtao Wang for the guidance of the analysis method of the weight distribution of the flow loss in a compressor cascade.